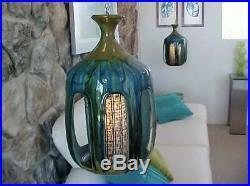 Up for sale is a pair of vintage Mid-Century Modern drip glaze lamps. The lamps are primarily blue and turquoise. Each lamp measures 12 in width and 20 in height (approx 30.5cm x 51cm). Each light comes with a long hanging chain. Both lights are in stunning EXCELLENT vintage condition and work perfectly. 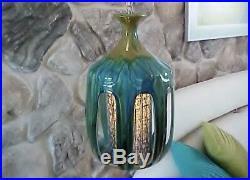 The item "Mid Century Modern Blue Swag Drip Glaze Hanging Light Lamp Palm Springs Vintage" is in sale since Saturday, February 2, 2019. This item is in the category "Antiques\Periods & Styles\Mid-Century Modernism". 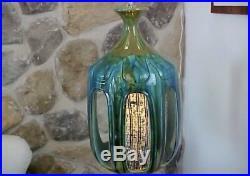 The seller is "candlelit_speakeasy" and is located in Los Angeles, California. This item can't be shipped, the buyer must pick up the item.